With the increase in popularity of micro cars in recent years, it’s easy to forget that the concept of a very small, compact and fuel efficient vehicle has been around for some time. In the Europe in the 1950s, with much of the continent still recovering from the ravages of war, there was demand for small and inexpensive cars. 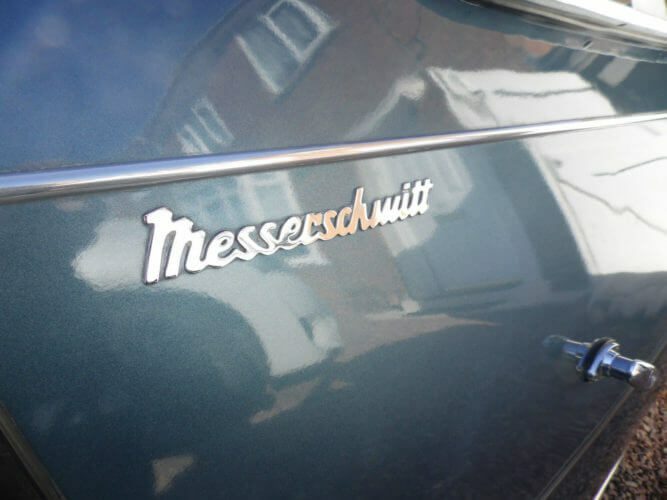 This led to the emergence of the famous bubble cars, the BMW Isetta, the Peel P50 and of course the Messerschmitt. After the war, Messerschmitt were temporarily prevented from building aircraft which ultimately let to a partnership between the aircraft manufacturer and designer Fritz Fend. His concept for a Kabinenroller or “scooter with cabin” was a means for Messerschmitt to continue manufacturing. 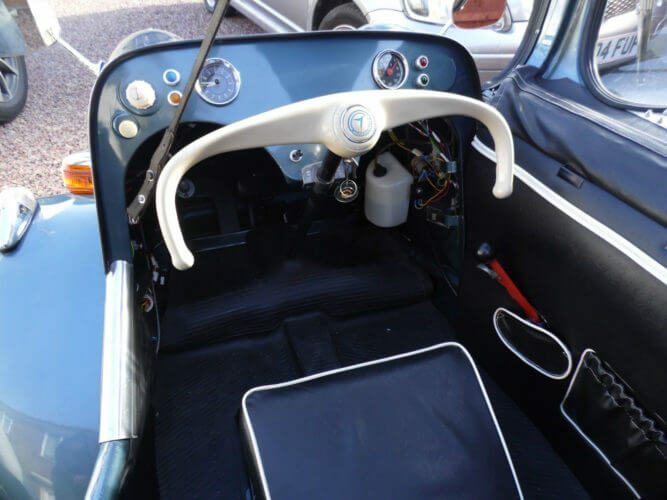 Production of the Messerschmitt KR175 tandem seat three wheeler began in 1953, with power coming from a single cylinder, two stroke 173cc engine which was mounted behind the passenger seat. A four speed sequential gearbox was offered with no reverse gear. 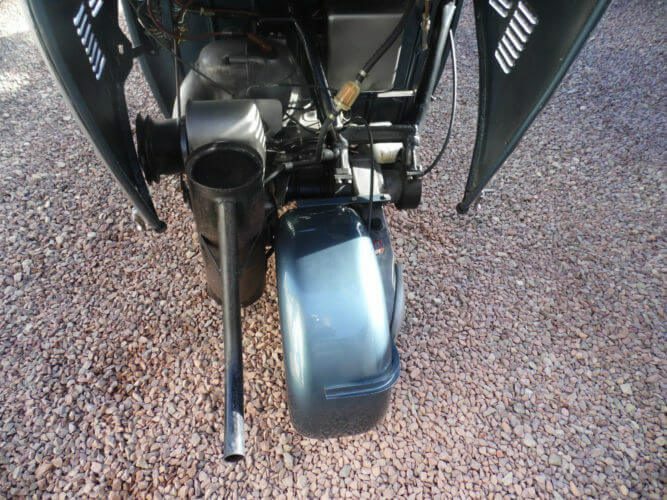 Steering was performed using a bar which looked like it came out of a plane and the throttle was operated using a twist grip like on motorbikes. 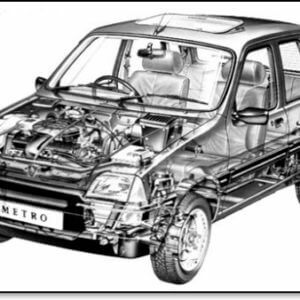 Its most recognisable feature, apart from being a long, low three wheeled micro car, was the side hinged plexiglass canopy roof. In 1955 the KR175 was replaced by the new Messerschmitt KR200. The engine was increased to 191cc and numerous improvements were made to the canopy, body and hydraulic shock absorbers were also installed. By the time production came to an end in 1964, some 40,000 had been built. 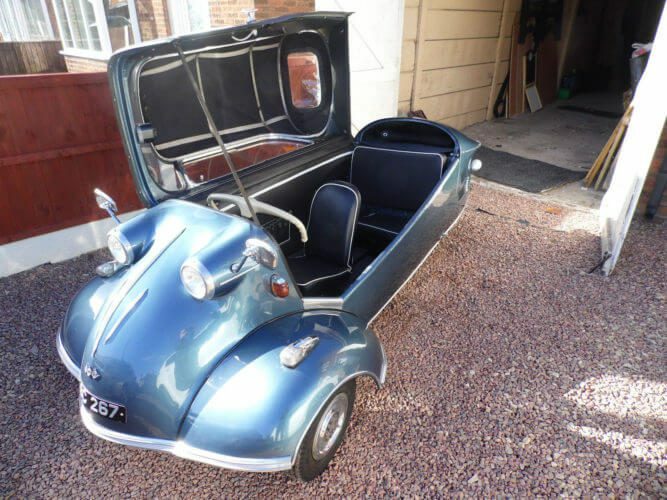 The model on offer is a 1961 Messerschmitt KR200 cabriolet. It is described as being in good condition and retains its original registration number. It has a blue exterior with a black interior with white piping. The current owner has fitted a new battery and an isolator switch. It has a spare wheel and its original jack and also has an optional kienzle clock fitted. 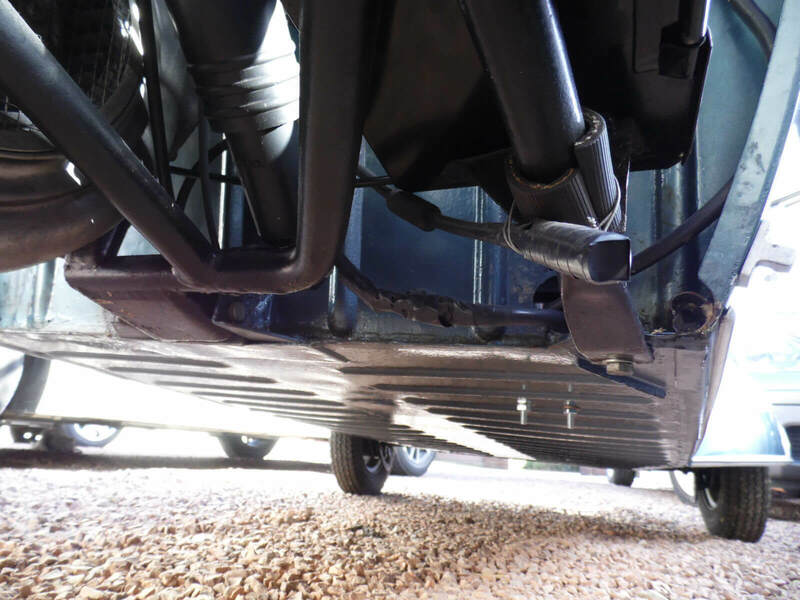 The underside is described as being in excellent condition and has the original spec ribbed floor. The seller notes that it currently doesn’t have an MOT and that the convertible hood is not fitting correctly. However a new hood is supplied with the car. Mileage is stated as being 35,952 but it is not said if this is backed up by history files or not. There isn't much to this engine bay. Tidy and compact! 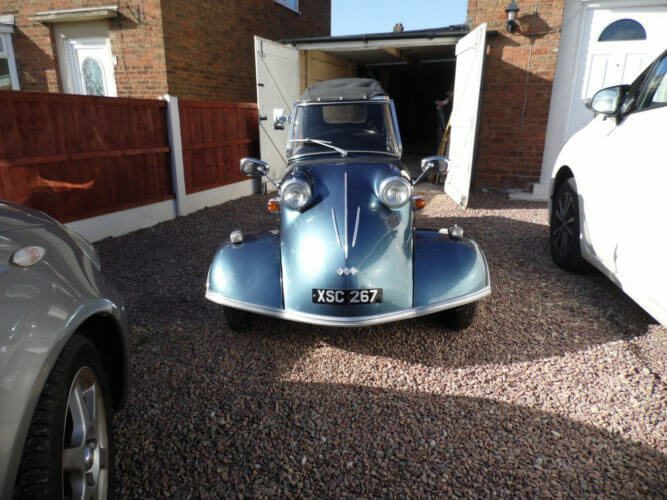 The face on the Messerschmitt is so distinctive. The chrome detailing looks to be in good order. The paint looks nice ans shiny. The steering wheel is great. The design doesn't like sharp turns however. 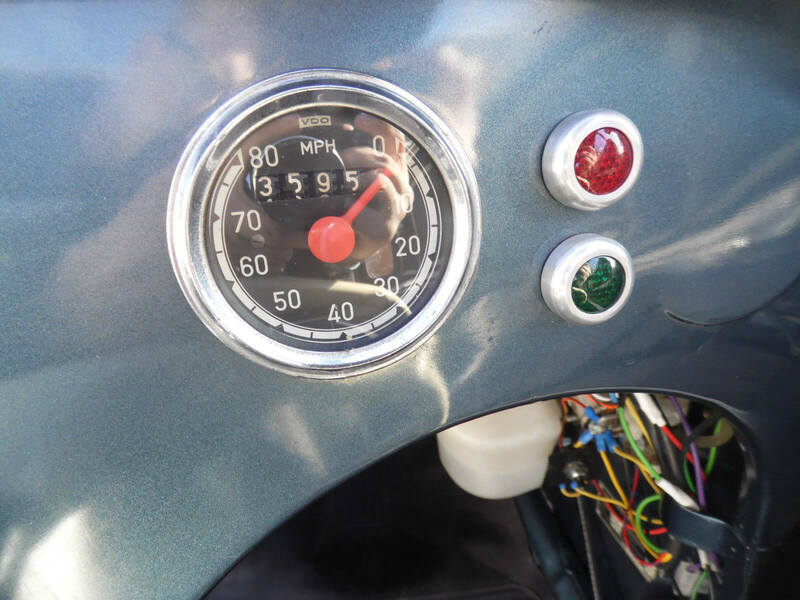 The dash is very simple which is nice. There isn't much to this tidy and compact engine bay. You got to love the profile of a car with canopies like this. The underside looks very good indeed. This Messerschmitt KR200 looks absolutely fabulous in it’s blue paint. It has a wonderful shine to it and coordinates well with the black trim and white piping. The underside looks as clean as the outside which indicates that this little micro car has been looked after. A quick check of the vehicle details shows that its MOT expired in March 2009 which seems to be backed up by the expired tax disc. Mechanically there isn’t a whole lot to go wrong on a Messerschmitt so the MOT should be straightforward. Hopefully the engine is in good order after being in what we assume was storage since 2009. 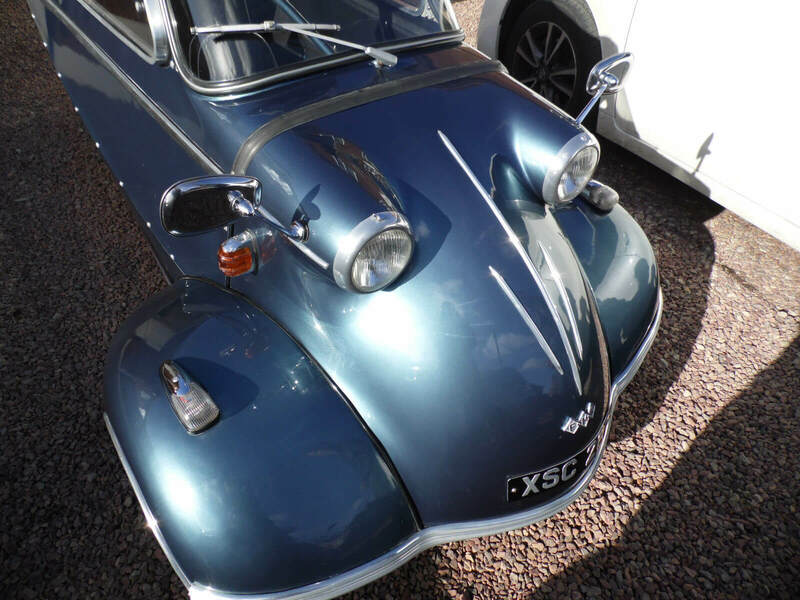 We absolutely love the Messerschmitt KR200. They are so unusual looking, have bags of charm and are adorably cute. They bring a smile to everyone’s face wherever they go. The fact that this is a convertible as well makes it even more fun. This example looks to be in great condition and hopefully shouldn’t take much to get through it’s MOT. We’d love to buy it and take it to shows and just drive around in it, pretending to be a fighter pilot with multiple bogies on our six. 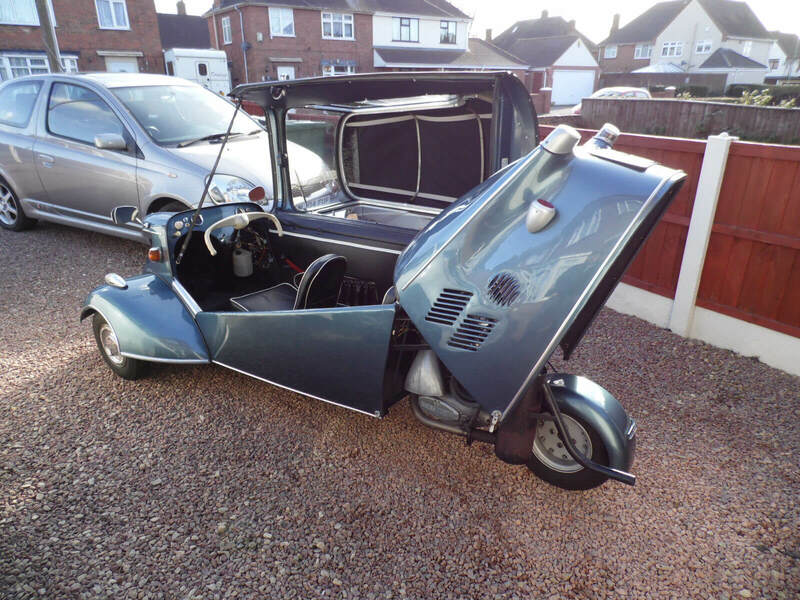 With a 1961 Messerschmitt KR200 with 54,193 miles on the clock selling for £18,000 at SWVA Auctions in January this year, this example looks to be reasonably priced. 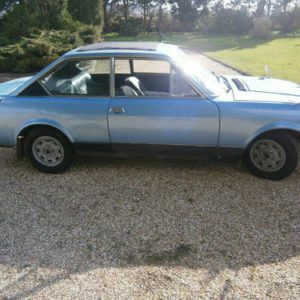 If it proves to be in as good condition as the photographs suggest and with just shy of 36,000 miles on the clock, it could well be worth it. The car is located in Walsall in the West Midlands with a buy it now price of £25,000 which is open to offers. Check out our Market Pick for a very famous and rare FMR TG500 Tiger. And watch our special Microcar feature film with the Hammond Collection here.